To accept disease due to “genetic predisposition” is like complaining about the president without ever having cast a vote. Only five percent of gene-related genetic mutations are fully penetrant, meaning that they cannot be changed, for example those with Down’s Syndrome and a small percentage of those with Alzheimer’s. However, the remaining percentage allows for great opportunity for the majority of the Earth’s population and great hope for anyone who, for example, thought because their parent had type 2 diabetes, that they also had to accept the same fate. 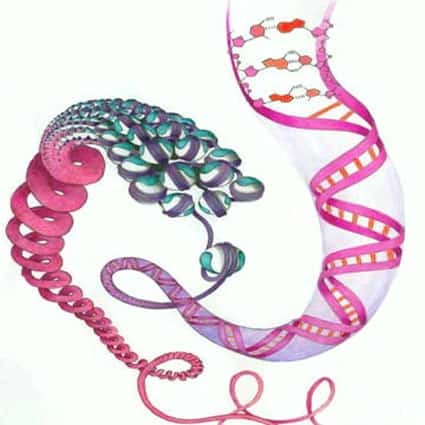 Epigenetics is a relatively new study in the field of genetics that essentially looks into the genetic trait variations that relate to the environment of the genes and what and how certain genes can be turned on and off. We cannot alter the genes themselves, but we can alter the way they are expressed–and that is very empowering. For example, I’ve used my favorite study subject (myself) to discover that polycystic ovarian syndrome can be completely reversed with no symptoms whatsoever through lifestyle and diet alteration, meditation, and stress management. Many die-hard Darwinians would argue against this; however, I am living proof. The belief that many diseases are incurable is becoming old news similar to “the Earth is flat” conviction. Disease-fated acceptance is a bad path to choose, but it’s a very lucrative one for anyone who makes a living managing others’ health, as opposed to optimizing it. It’s easy to say (and ignore) the usual “eat healthy, exercise and be well, and you will feel better.” It’s quite another to realize that you can halt and even reverse certain conditions through changing your own biology. Scientific research is currently being conducted by the Chopra Center and Gallup, led by Deepak Chopra–a world renowned scientist, doctor, and author–that is beginning to show that when people switch to a whole-foods diet rich in omega 3 plant sources, exercise regularly, practice yoga, meditation, and regularly express gratitude, they are actually able to positively affect their chromosomal telomere length. Telomeres protect our DNA strands from shortening during cell division, and since our cells are constantly dividing and dying off, we are always aging. However, if we can lengthen our telomeres we can lengthen our lives and prevent degenerative diseases. One of the most impactful yet easy to implement ways to begin your “telomere lengthening abilities” is to practice yoga and meditation every day. Even 10 minutes of each activity will begin to slow the mind and set you into what some call “the gap,” where life simply occurs–thoughts are minimized and we begin to live in the moment of what reality actually is, instead of what we create in our mind. Eating healthfully is something I touch on in almost every article, because, well, that’s what I do! But healthy is different for everyone. My diet may differ from someone who is just as optimally healthy and functional–it’s all relative. The first step is always elimination and or minimization of alcohol, processed foods, genetically modified foods, and conventionally raised meats and dairy. Additionally, for those who still feel as though they are having issues with diet, I strongly recommend a food allergy test. Recently I found out that my beloved peanut butter and I simply don’t mesh, as much as I would like it to work–it’s something I have to avoid, at least for now. If allergy testing isn’t your thing, there is also the elimination diet option, which can be easily elaborated simply with a little research. It’s strict but worth it, especially for those with food sensitivities, hormone and thyroid issues, as well as autoimmune diseases. Another little known fact is that the more you surround yourself with happy people, the happier you will be! Better yet, if your happy friend has a happy friend, your happiness factor increases even more, and continues to increase as the chain continues, according to Gallup. Happiness begets more happiness! Nothing is set in stone, your health and happiness potential is completely in your hands! Great article – and these ways to affect epigenetics cost very little compared to the benefits. As for allergy testing that was mentioned, if you’re not sure where to start, get an initial screening done at allergyscope.com. From there, you can decide if you need to see a doctor as a follow-up.